This gallery contains a selection of photographs showing many of the Ford Thames Traders that were operated by Edward Beck over the years. A number are in the livery of Edward's early originally owned companies while others are in Edward Beck & Son Ltd heavy haulage fleet company livery. 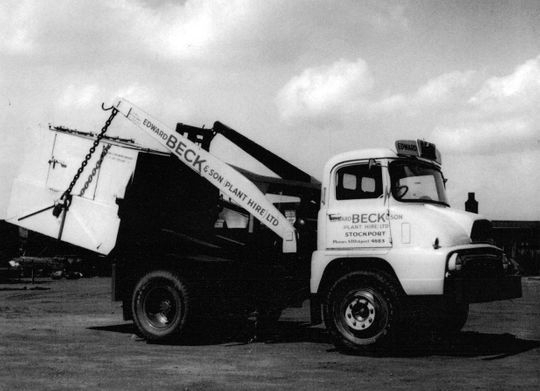 Pictured here in 1960 are just three of the many Thames Trader four wheeler tippers that Edward Beck ran in the livery of 'Contractors (Manchester) Ltd' which was one of Edward Beck's originally owned companies that concentrated on demolition, building & civil engineering works. 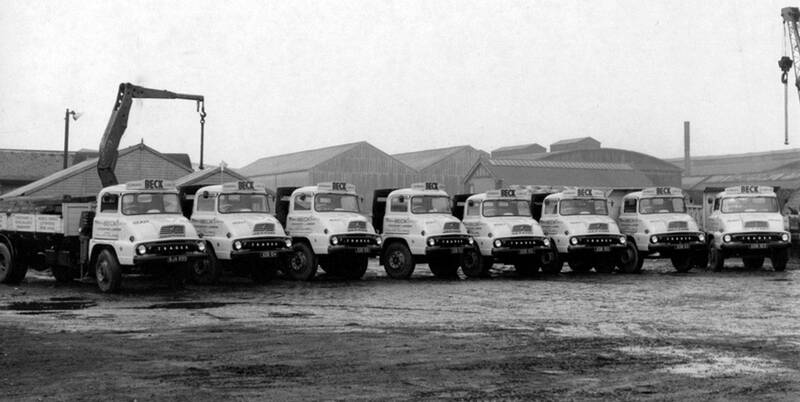 This impressive line up of 14 Thames Trader's, comprising a mixture of tippers and flats, are pictured parked in the depot at Greg Street in 1963. 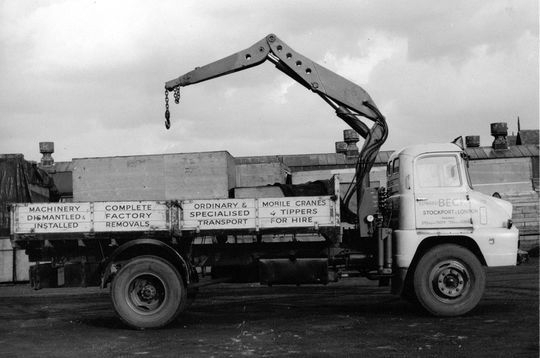 At the time the company had about 35 Thames Traders in the fleet. Best viewed at full size by clicking on image. A close up shot, taken in 1963, shows a few of the Thames Trader's in the fleet which at that time comprised of a mixture of tippers and flats. Again this is another fine picture which is best viewed at full size on your screen by clicking on the picture above. 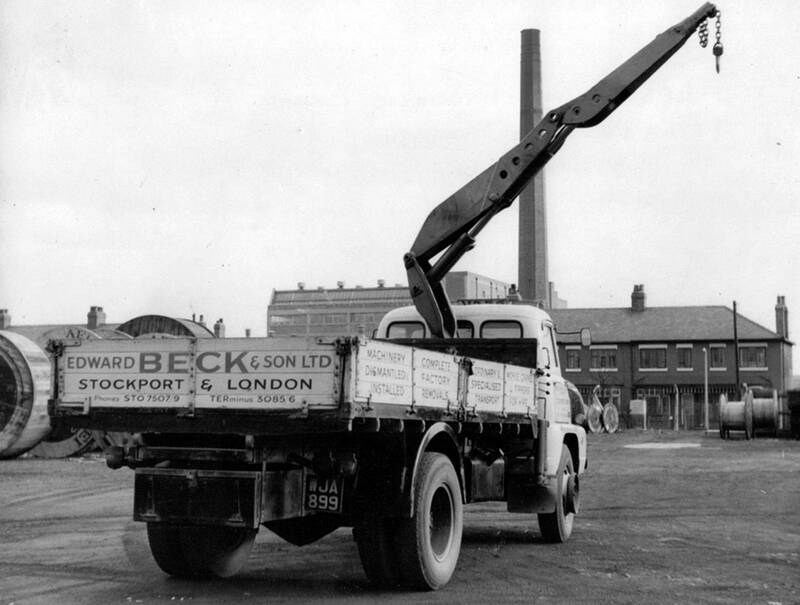 1964 and these Thames Trader four wheeler tippers ran in the livery of another one of Edward Beck's original companies called Edward Beck & Son (Plant Hire) Ltd.
Edward Beck & Son (Plant Hire) Ltd also ran this 1967 registered Thames Trader which was fitted with one of the original waste disposal units manufactured by Powell - Duffryn. 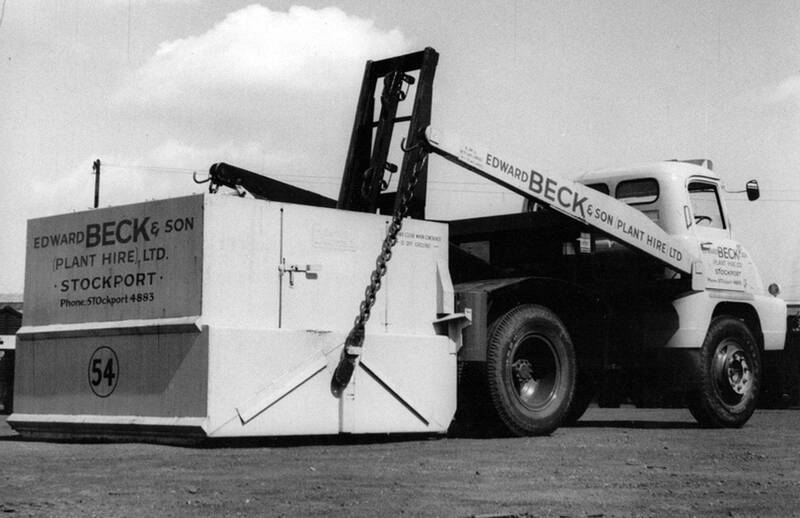 These portable waste disposal units were the forerunners of the kind of skips and waste containers we see all over the country today. 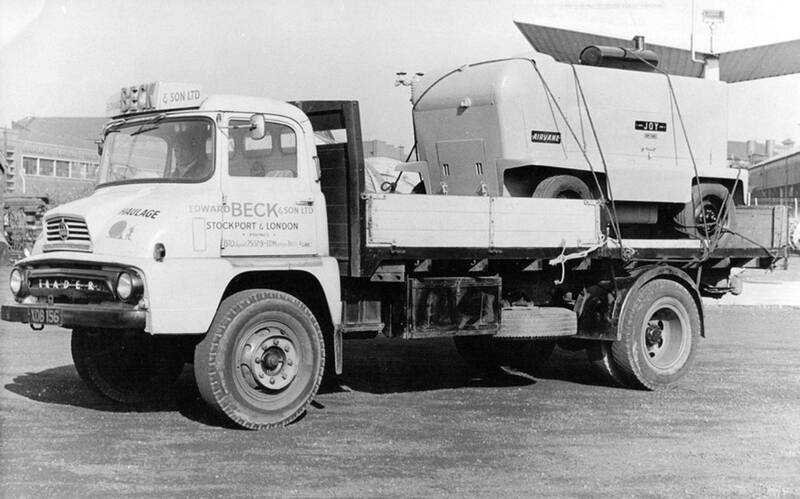 A rear end shot of Edward Beck's 1967 registered Thames Trader which was fitted with hydraulic equipment to lift a waste disposal unit manufactured by Powell - Duffryn. Ford Thames Trader four wheeler flat Reg No WJA 899, which was fitted with an Atlas hydraulic crane, was used for machinery removals and also as a tackle wagon for support during the movement of abnormal loads by the heavy haulage fleet. 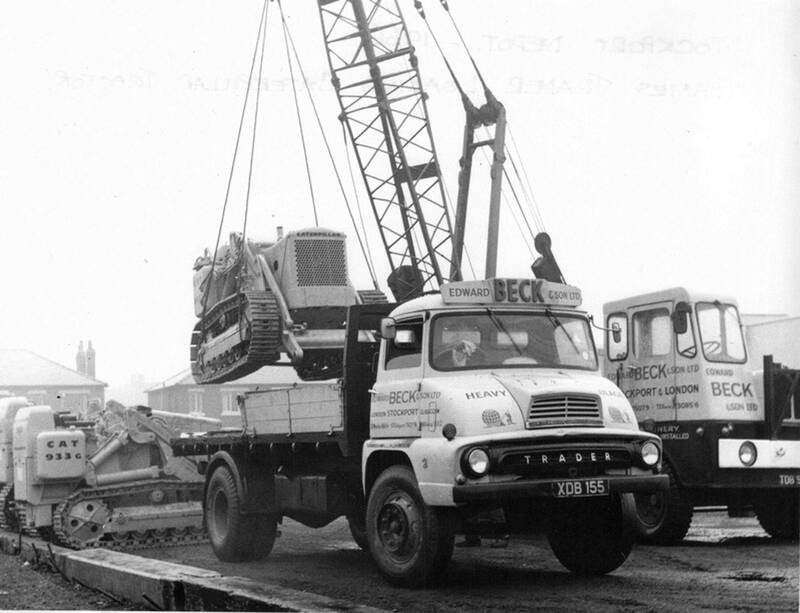 Ford Thames Trader four wheeler flat Reg No WJA 899 is pictured here demonstrating it's Atlas hydraulic crane which was used during machinery removals and also as a tackle wagon for support during the movement of abnormal loads by the heavy haulage fleet. 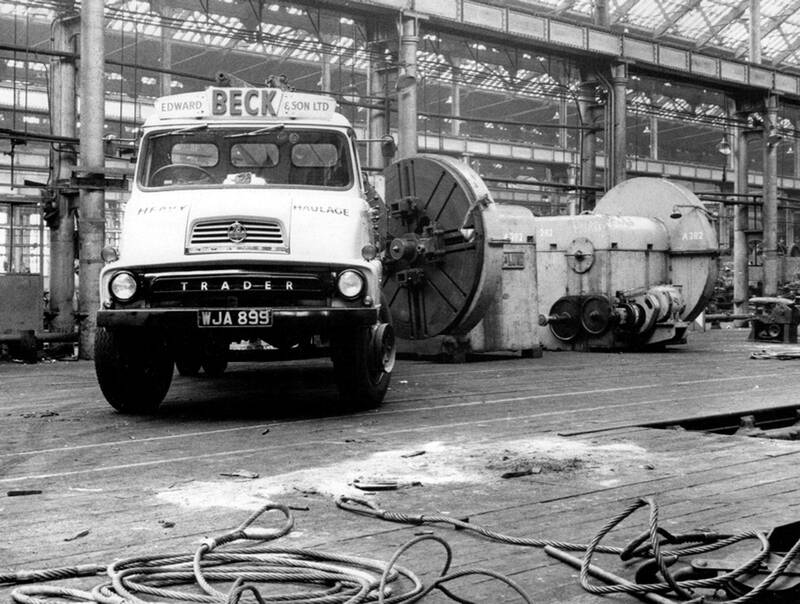 Thames Trader four wheeler flat Reg No WJA 899, fitted with an Atlas hydraulic crane, is parked up while the 'machinery gang' prepare to move a large Noble & Lund machine press. 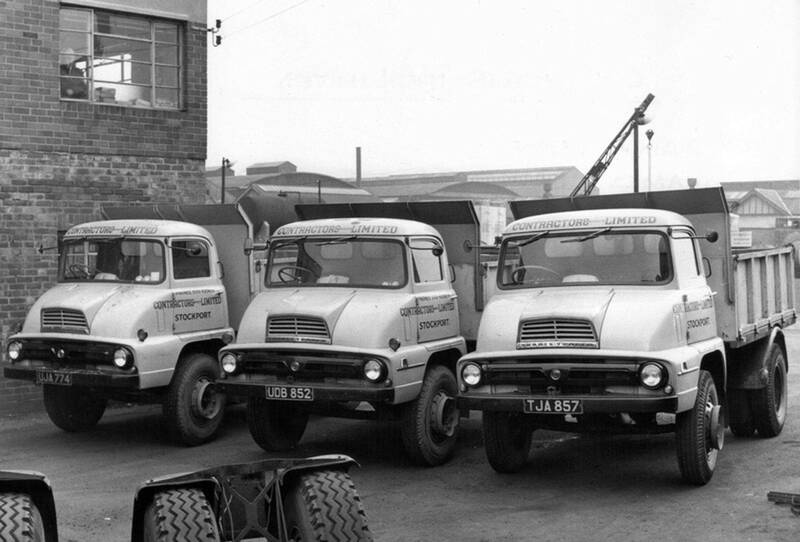 Another shot of Thames Trader four wheeler flat Reg No WJA 899. 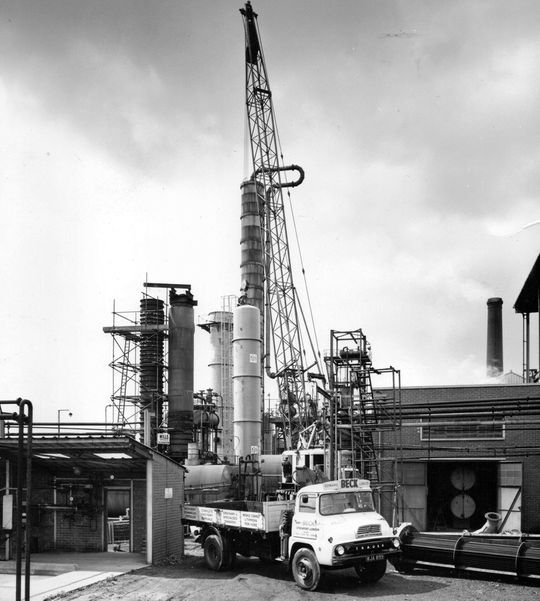 Fitted with an Atlas hydraulic crane it is seen here in 1968 at a chemical plant after unloading a piece of machinery on behalf R & J Dempster who were constructional gas and chemical plant engineers, producing gasholders, gas works plant and chemical plant equipment. Assigned to the heavy haulage fleet Thames Trader four wheeler Reg No XDB 155 breathes a sigh of relief as a Caterpillar bulldozer is unloaded in the depot at Greg Street after being transported from Salford Docks in 1966. 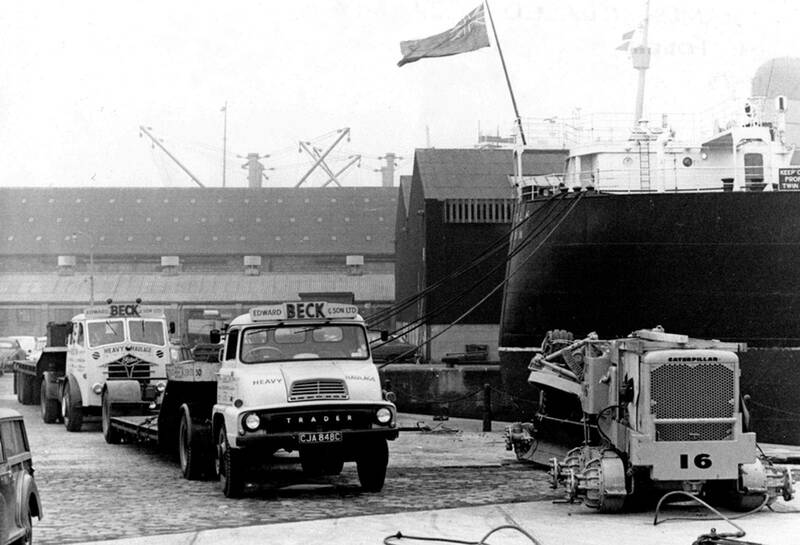 Thames Trader four wheeler Reg No XDB 156 pulls off the fuel island at Greg Street depot while loaded with an Airvane air compressor. 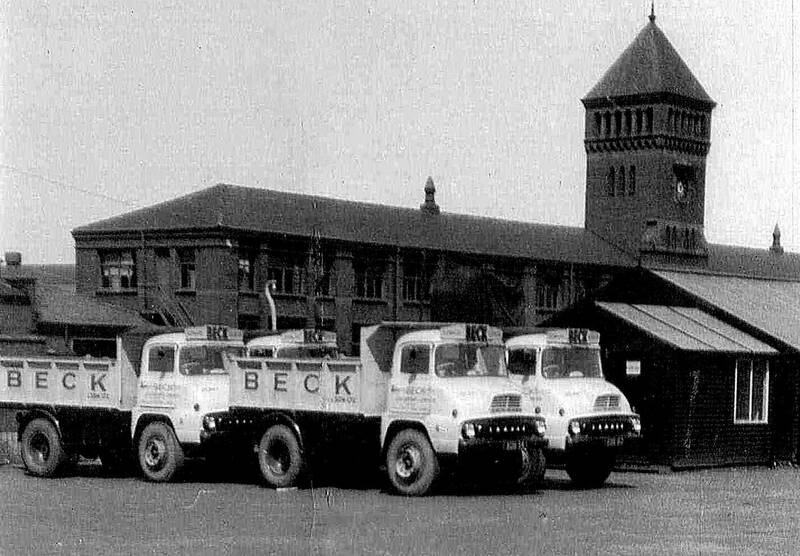 Parked adjacent to the fuel pumps in the depot at Greg Street Stockport in 1968 is Thames Trader 4x2 tractor unit Reg No BDB 692B. 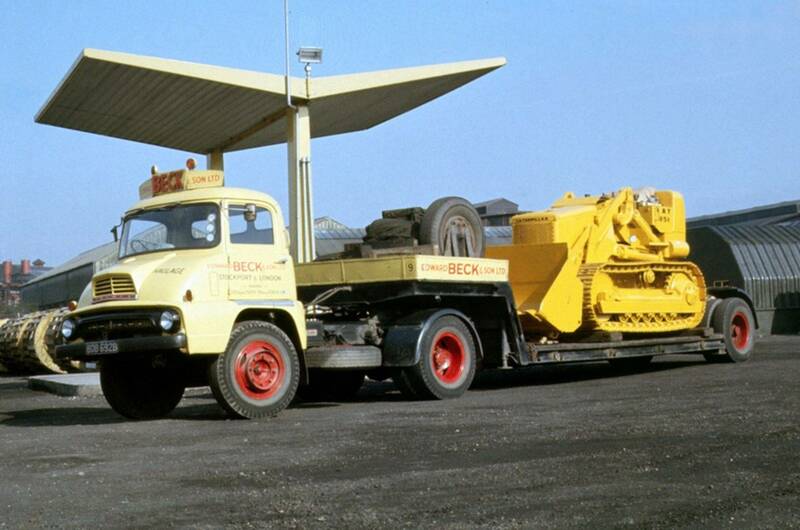 Registered new in 1964 it is pictured coupled up to one of the company's 12ft 6in Carrymore low loaders with a Caterpillar bulldozer on board. 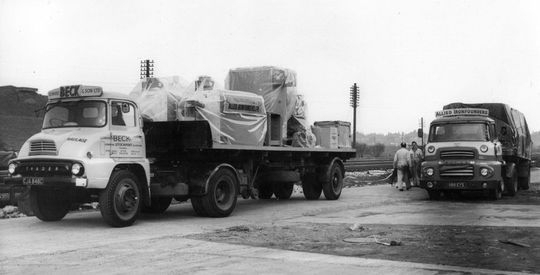 Another shot of Thames Trader 4x2 tractor unit Reg No BDB 692B with a mixed load of machinery on board a single axle trailer. This 1965 registered Thames Trader tipper was one of many that were purchased by Beck's after the closure of Thomas Nield & Son Ltd of Gatley. Reg No CND 8C is pictured here on the weighbridge at Greg Street depot in 1966 still in Thomas Nield and Son Ltd livery, apart from the addition of an Edward Beck & Son Ltd headboard. 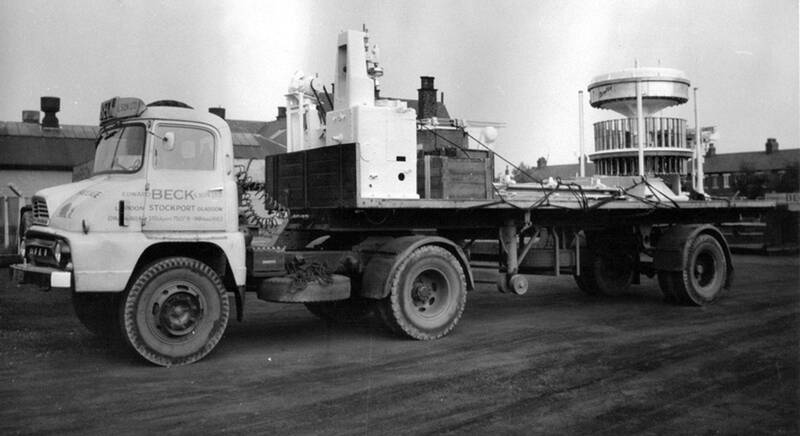 Thames Trader 4x2 tractor unit Reg No CJA 848C, a brand new addition to the fleet in 1965 is parked in front of Foden 4x2 tractor unit Reg No KDB 703. They are pictured at the long gone Salford Docks while waiting to load up with a Caterpillar bulldozer's which had arrived by cargo ship from the U.S.A.
Thames Trader 4x2 tractor unit Reg No CJA 848C is seen here in 1966 loaded with industrial boiler equipment while working for Allied Ironfounders Ltd of Audenshaw near Manchester. 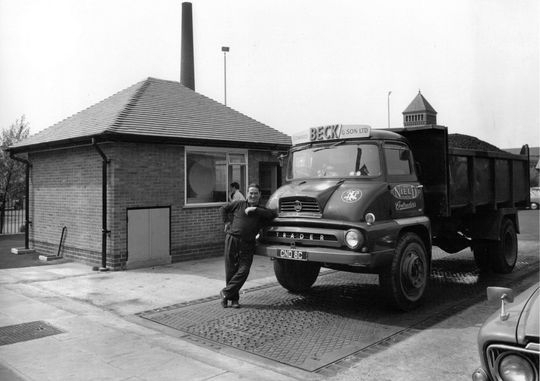 Taken over by Glynwed International in 1969 Allied IronfoundersLtd had designed and produced the first solid fuel combined cooker and water heater back in 1946, commonly known today as an AGA.